The Weston 48" Propane Smoker gives you the convenience of your home kitchen on the go. This smoker comes with a fully adjustable propane delivery system along with a 20,000 BTU burner and rotary igniter for easy startups. We are talking about some serious cooking power here - this unit can generate the heat of 20,000 wooden matches burning at the same time. The unit's three adjustable dampers will allow you to easily and precisely control both cooking power and smoke quality. Try doing that with a charcol smoker! Contrary to popular misconception, you can enjoy this propane smoker and experience the smoked taste on your favorite meats, wild game, vegetables, nuts and fish because taste is dictated by the use of flavored, wood chips, not charcoal. The unit's 1.8 cubic feet of capacity is more than sufficient to smoke a boat load of food. It includes a large porcelain-coated water bowl and cast iron wood chip/smoking box. 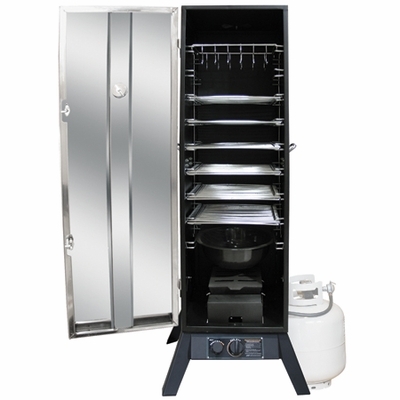 Both grids and racks are included with this propane meat smoker for making sausages and other meat products. The temperature display provides accurate cooking status that also ensures the highest quality results. A great value for the price. * Fully adjustable propane fuel delivery system. * Rotary igniter for easy start up 3 adjustable dampers to maintain temperature and smoke quality. * External temperature gauge accurately displays the internal temperature of the smoker. 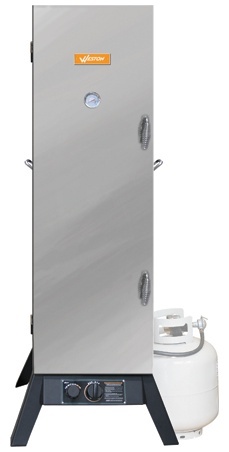 * 48” unit comes with six 14 ½” chrome plated cooking racks. * Large porcelain-coated water pan. * Cast iron smoking box. * Fully welded, heavy gauge, black-coated steel cooking cabinet.